I decided to try my hand at building and experimenting with a Twitterbot on a dedicated Twitter handle since I had completed Patrick Smyth’s API workshop once before. I worried about participating in a discussion where a language barrier could pose a problem since tweets would be a mix of English and Tagalog. I will probably continue to tinker with this idea if it could be of some use, creative or otherwise. 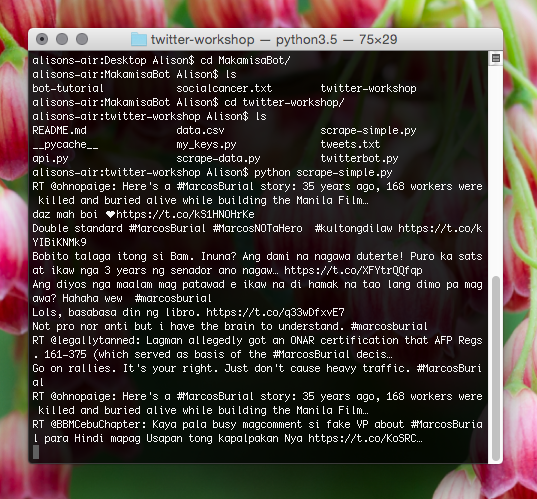 I’ve instead started using the tutorial below on making a Twitterbot with Python to play around with @MakamisaBot and text files from Project Gutenberg. Makamisa (meaning “after mass”) is believed to be Jose Rizal’s third, unfinished novel. Jose Rizal is considered a national hero in the Philippines – his literary work at the end of Spanish occupation in the late 1800s influenced Filipino resistance and he was ultimately executed by firing squad for his writings on December 30, 1896. Rizal’s novels were originally written in Spanish, then translated to Tagalog and English. They are part of the public domain and I chopped them up to use for my project. Makamisa’s manuscript ends abruptly with: “Although it was rumored that aunt Anday received slaps on her face, they still do not [have]” (translated in English). If I could get the script to work, I’d be interested in producing similarly unfinished sentences using available text from his preceding novels, Noli Me Tángere and El Filibusterismo. 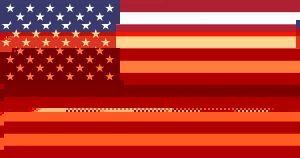 This entry was posted in Cloud Text Experiments on November 22, 2016 by Alison Boldero. 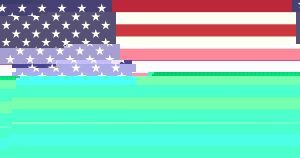 Three American flag .jpgs with “rise like lions” spliced variously into their .txts. 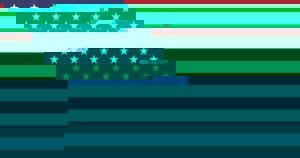 This entry was posted in Cloud Text Experiments and tagged american, flag, glitch, image on November 22, 2016 by Jason Scaglione.